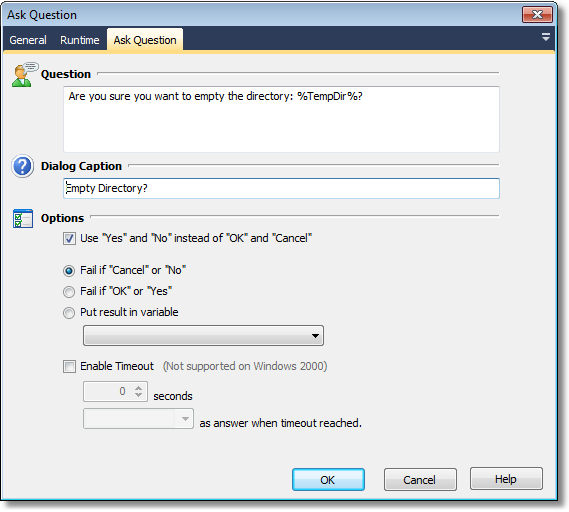 This action allows you ask the person running the project a yes/no type question. You can optionally store the result in a FinalBuilder variable. For more information on variables, including creating your own project and user variables, see here. Note: This action should not be used unattended as it will cause them to hang waiting for user input. By default, interactive actions are not available from the FinalBuilder console. Interactive actions cannot be used inside Async Action Groups. This is the question that will be displayed in the dialog box. It may contain variables which will be expanded at runtime. The text to use for the dialog caption. The dialog has two buttons, either OK and Cancel, or Yes and No - choose which style you want to use.